In the late 1800s, when automobiles started replacing horses in the United States, farmers were likely pondering how the new technology could be adapted for agricultural production. Before long, tractors revolutionized the industry. 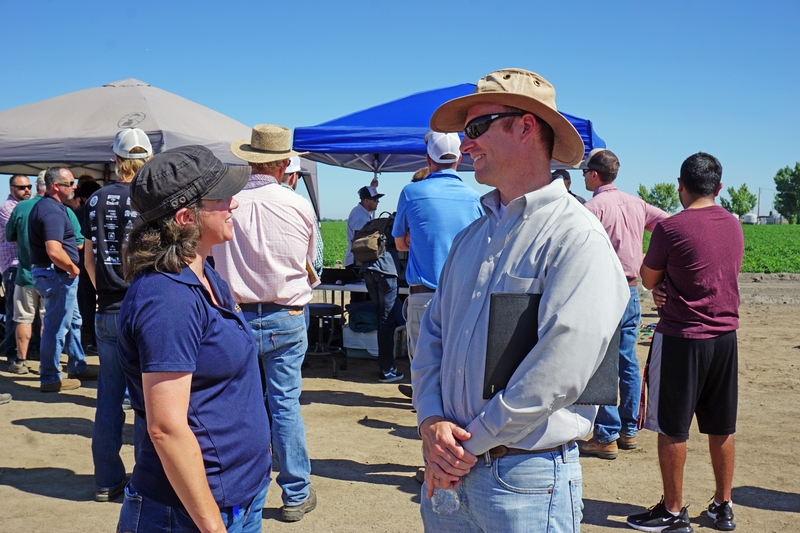 A similar scenario unfolded in June at a UC Cooperative Extension field day in Merced County. Farmers, scientists and entrepreneurs gathered at Bowles Farm in Los Banos to learn how drones may be deployed on farms of the future to improve irrigation, fertilization and pest management practices and monitor the crop to maximize yield and profit. Instead of driving a pickup truck around the perimeter of the field, pushing through hip-high row crops, or meticulously sampling dozens of tree leaves, a quick fly-over with the right equipment could provide farmers all the data they need to make production decisions. 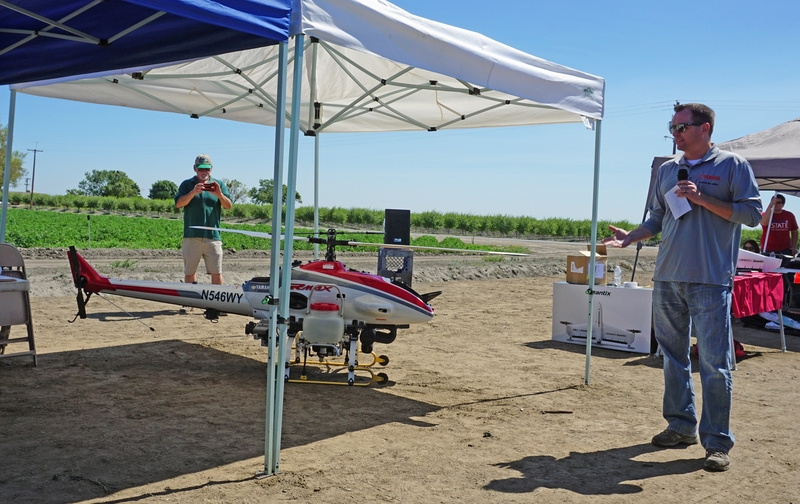 During a field day demonstration, this drone flew autonomously back and forth over the field, then landed within two feet of the takeoff location. This won't happen tomorrow. Regulations still hamper drone use and the cost of some equipment is prohibitive. 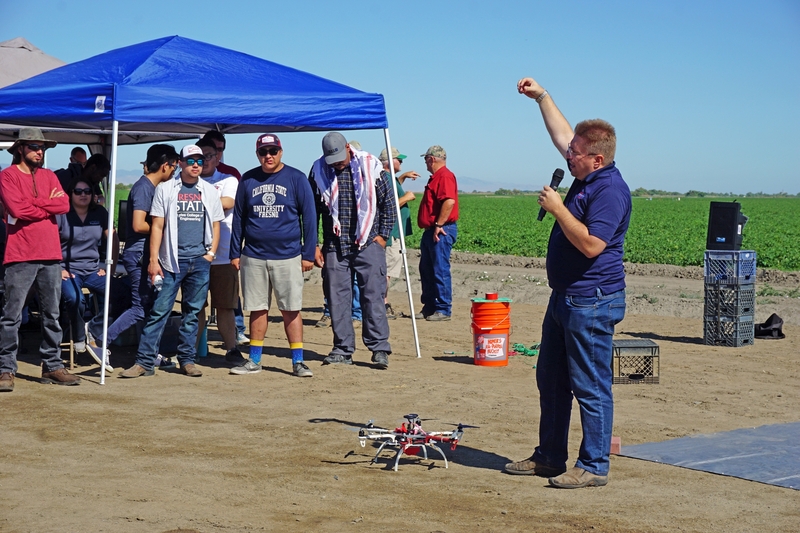 But UCCE advisor David Doll is working with scientists at UC Merced and Fresno State to find low-cost alternatives for data collection and analysis that will make the information collected by drones of value to farmers. “We were able to get good correlation with plant water stress using a thermal camera, however the platform is too expensive,” Doll said. Doll's research, funded by a grant from UC Agriculture and Natural Resources, uses data from hundreds of drone flights over an almond orchard. The project has shown that monitoring perennial cropping systems from the sky presents challenges. Justin Metz, left, and Emory Silberton are part of the technology integration team at Bowles Farm. 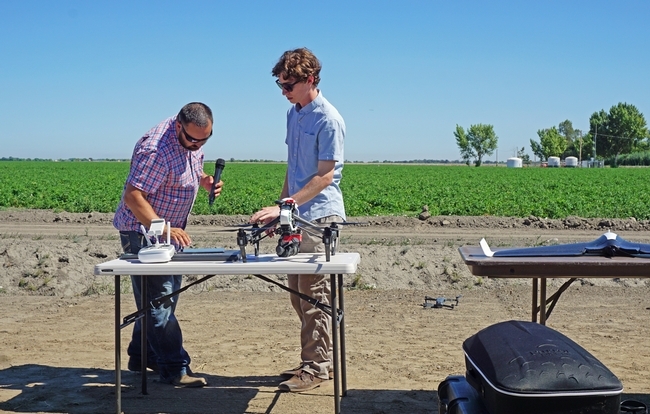 They flew a small drone to demonstrate their crop monitoring practices. 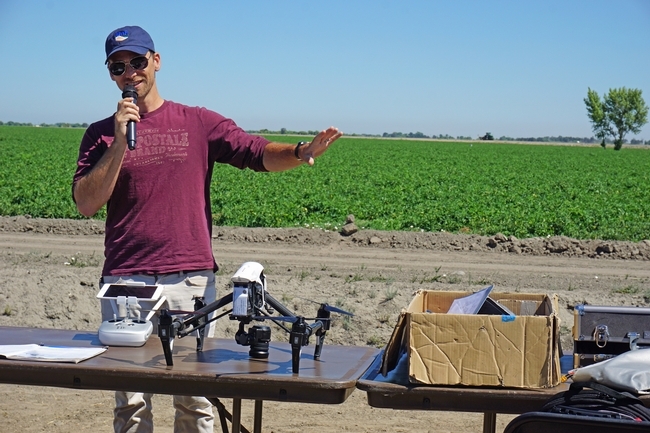 Bowles Farming Company, which hosted the field day, flies drones over its farms three days a week, said Justin Metz of the company's technology integration team. The high-definition imagery is shared with the on-staff agronomist, who can diagnose emerging issues. Lynn Sosnoskie, left, and David Doll talk at the drone field day. 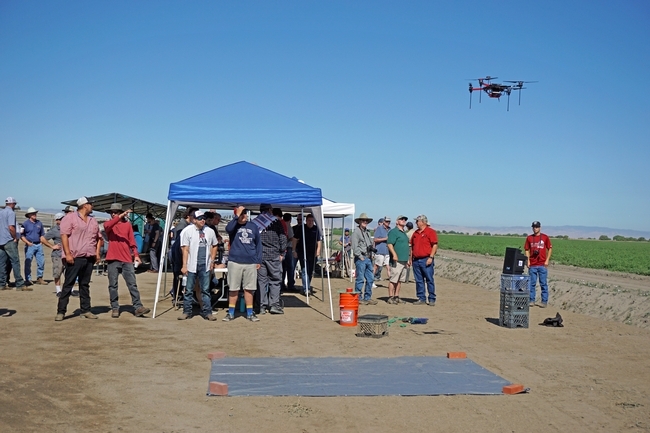 UCCE agronomy and weed science advisor Lynn Sosnoskie attended the drone field day to gather ideas and make contacts. She believes drones have the potential to monitor crops for herbicide injury. “I want to ground truth drone images to see if they can predict yield loss,” Sosnoskie said. 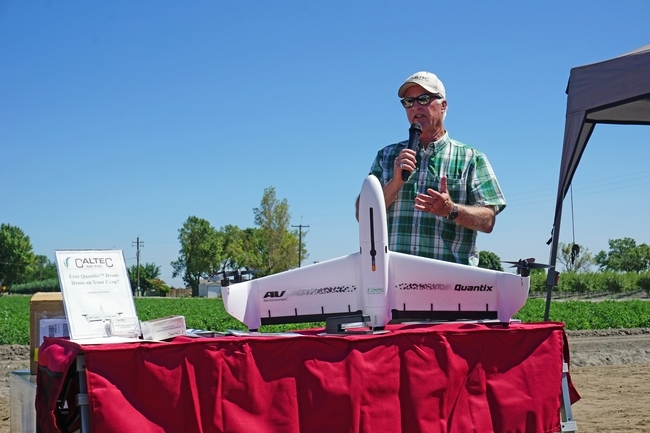 Retired pest control adviser Richard Stewart, one of about 100 attendees, is considering how drones could be used to monitor for rodent damage in irrigation ditch banks. 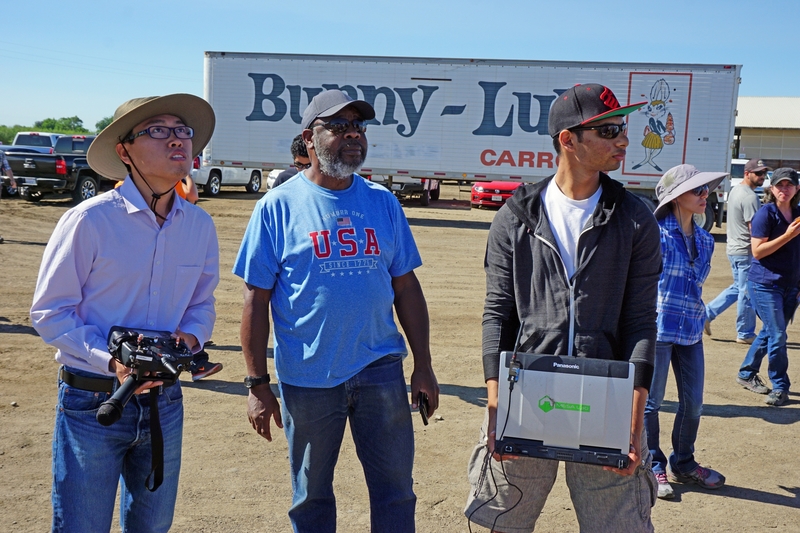 UC Merced graduate students Michael Haoyu, left, and Joshua Ahmed, right, demonstrated the drone they use to gather data over farms. In the center is retired PCA Richard Stewart, who is considering starting a consultancy using drones to monitor for rodent damage. 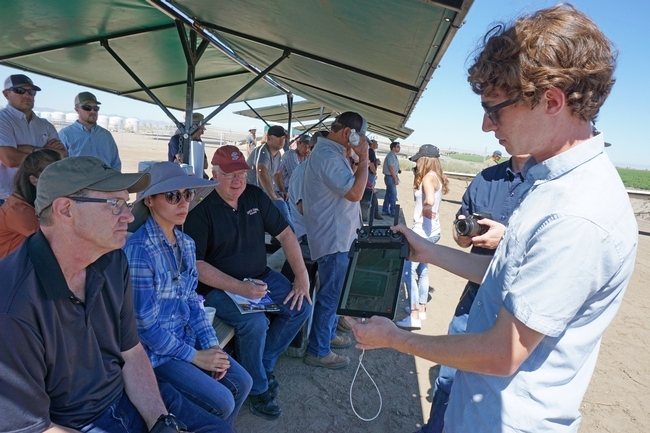 During a drone flight, Emory Silberton shows real-time crop monitoring on a tablet computer. Drone technician Jacob Flanagan is part of the UC ANR's Informatics and Geographic Information Systems drone team. James McKay of CalTec Ag Inc. showed a drone that takes off and lands vertically, then levels out in the sky. Fresno State electrical engineering professor Gregory Kriehn is conducting research on the use of sensors in farm fields to collect data and transmit the information to drones. Michael Noricia, co-founder and CEO of Pyka autonomous aerial application, said his battery-powered drone can carry 200 pounds of chemicals to spray on crops. 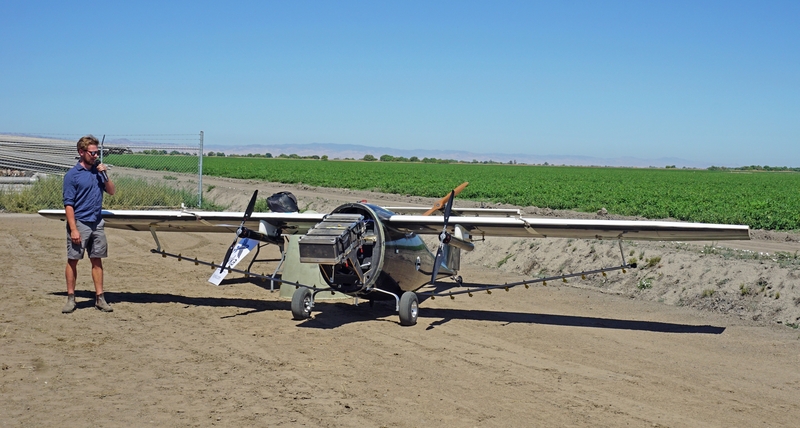 Brad Anderson of Yamaha Motor Corporation said the company's mini helicopter, which can carry a 4.2 gallon payload, is used widely for spraying crops in Japan.